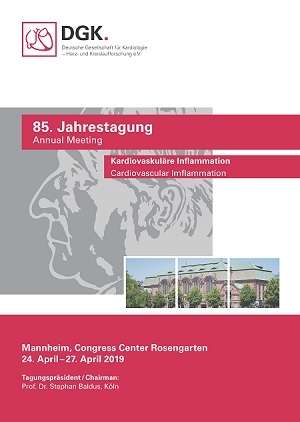 The congress will take place from April 24 to 27, 2019, with the theme "Cardiovascular Inflammation". Congress President is Prof. Dr. med. Stephan Baldus from Cologne. All submissions below the age of 35 are automatically nominated for the Hans-Blömer-Young Investigator Award for clinical cardiovascular research or the Rudi-Busse-Young Investigator Award for experimental cardiovascular research. For this it is absolutely necessary to state the date of birth of the first author. The abstracts are selected on the basis of the assessments submitted. All other abstracts will be assigned to a free lecture session or a poster session.